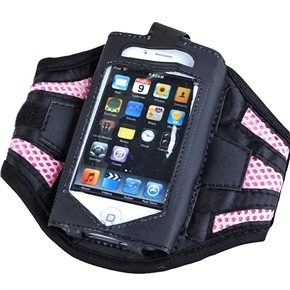 This black and pink armband is suit to hold your iPhone 4 and iPhone 4S while you are walking, running, playing basketball, etc. Decent mesh style holder features adjustable band to fit your hand. - Color: black and pink. - Suitable for iPhone 4 and iPhone 4S. - Mesh style armband, adjustable holder. Customer Rating: 3 customers would recommend this product to their friends. Agree with them, or you have different ideas? Write your comments. GREAT SELLER! Items shipped fast and just as described! Thx! Extremely Fast delivery. Perfect condition as described. Thanks!